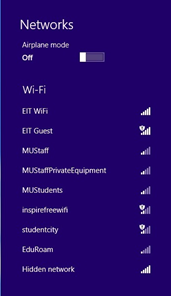 You may use your own device(s) (this includes laptops, iPads, iPhones, Android, and other smartphones and tablets) to connect to EIT's WiFi while on-campus. You may be asked to authenticate several times. Windows XP & Vista are not supported as its manufacturer Microsoft has dropped all support for it. However, Windows XP devices running Service Pack 3 (SP3) may be able to connect, however this is untested and is not supported. IT Services recommends updating your operating system. If you have a Windows XP device and are unsure about the Service pack you are running click here for simple instructions. Samsung Devices running Gingerbread Android version 2.3.3 to 2.3.7 have reported to have issues connecting. Only a small percentage of such devices have been able to successfully connect. Other manufacturers that produce Gingerbread devices have not reported the same issue to date. If you are having trouble using your device that has this version, IT Services recommends you update your operating system. If you are unsure about the Android version your device has click here for simple instructions. 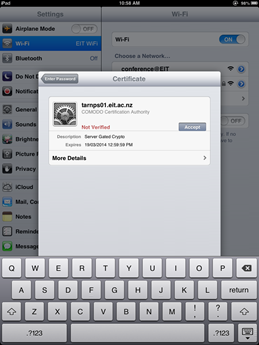 Authenticate to the EIT wireless network on your device. For instructions, click on the operating system your device uses. 1. 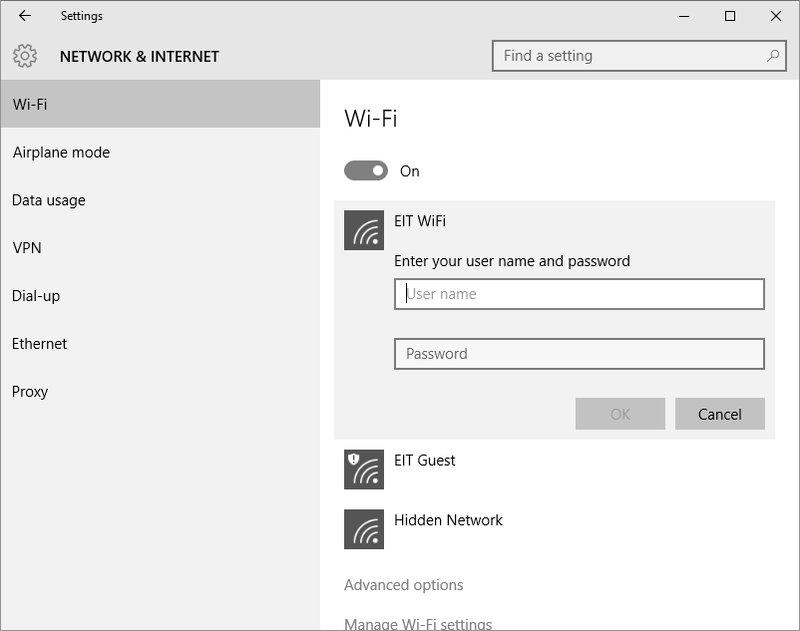 Click on the wireless network icon in the system tray and click EIT WiFi network. It is recommended to tick Connect Automatically which means while you are on-campus this network will connect to your device. Click Connect. 2. A network authentication screen will appear. Enter your EIT network username and password. 3. 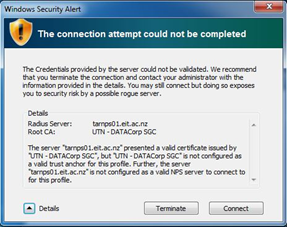 A connection attempt server certificate will appear. This certificate is set to authenticate to the EIT authentication server, click Connect. You may be prompted to enter your EIT network username and password again. 4. You may be prompted to set your location during the set up process. Click Public network. You will see that the network bars will have signal at the bottom of your screen but will have a yellow triangle. 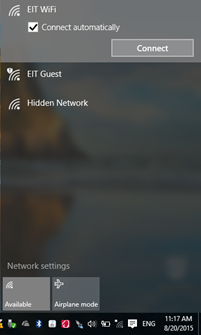 This means you are connected to the EIT Wifi connection. Depending upon the computer or device you have it may look slightly different from below. 1. Press the Windows Key + D on the keyboard and the desktop will show. 2. 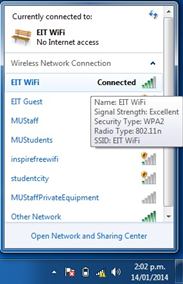 Click on the wireless network icon in the system tray at the bottom and click the EIT WiFi network. 3. A box will appear. 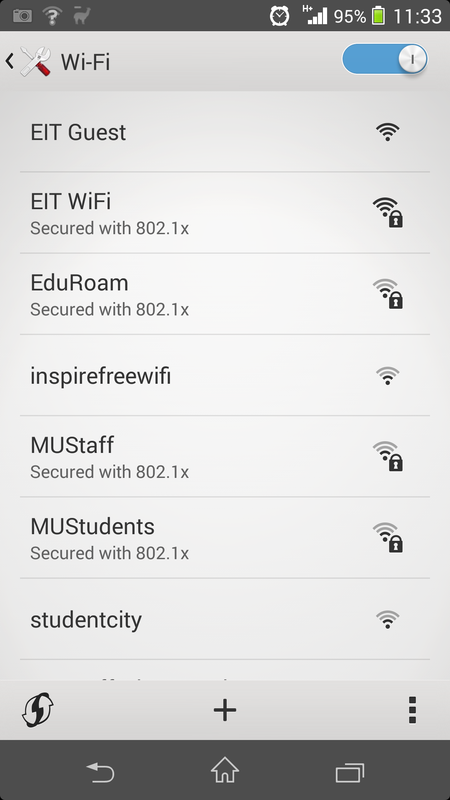 It is recommended to tick Connect Automatically which means while you are on-campus this network will connect to your device. 4. A network authentication screen will appear. 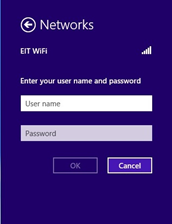 Enter your EIT network username and password and click OK.
5. A connection attempt server certificate will appear. This certificate is set to authenticate to the EIT authentication server, click Connect. You may be prompted to enter your EIT network username and password again. 6. You may be prompted to set your location during the set up process. Click Public network. You will see that the network bars will have signal at the bottom of your screen but will have a yellow triangle. 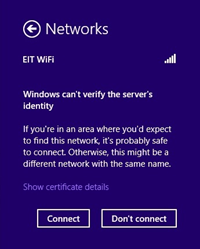 This means you are connected to the EIT Wifi connection. 1. 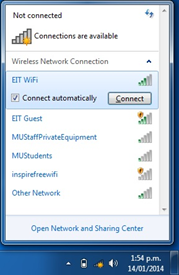 Go to the Wi-Fi Settings page, and select the EIT WiFi network. 2. 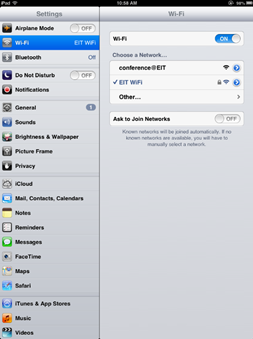 Settings for the EIT WiFi network will open. 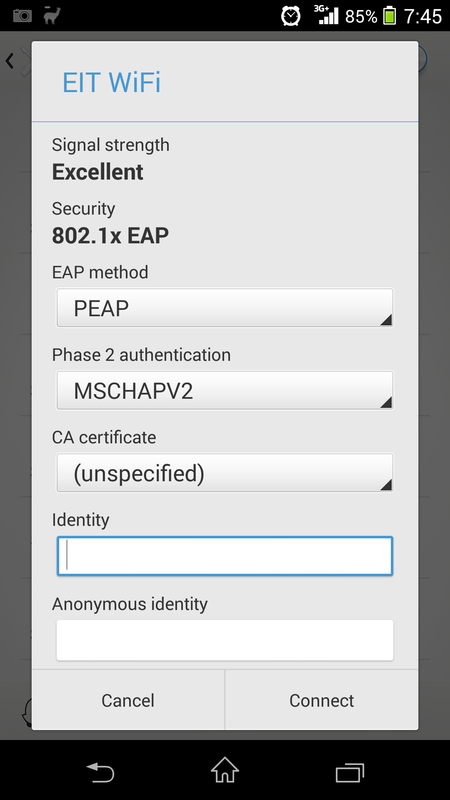 It will display information about the method the wireless uses and the authentication type. 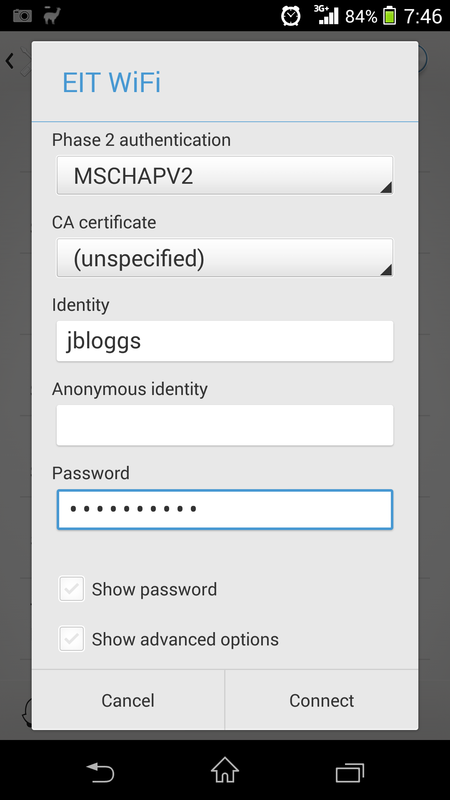 Click on the drop down where is says Phase 2 authentication and choose MSCHAPv2. It will prompt you to enter your EIT username and password. Please enter these in. 3. 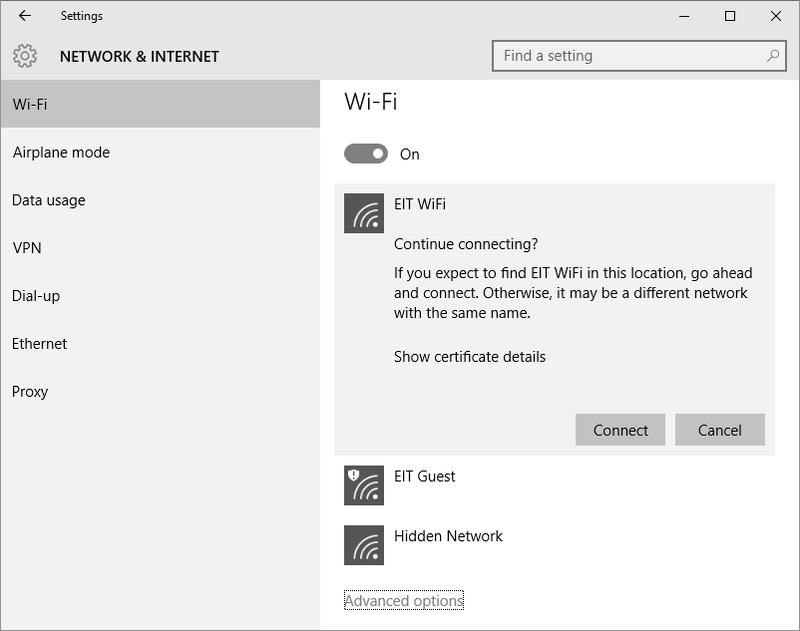 At this stage you are should now be successfully connected to the EIT WiFi. 1. 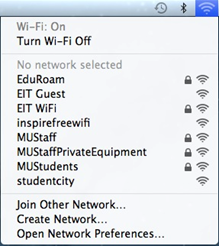 Locate the Wi-Fi/Airport status menu (in your menu bar in the upper right hand corner of the screen). Screenshots vary according to your OS version. 2. 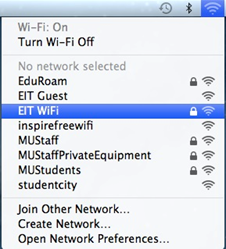 Click on EIT WiFi. 3. 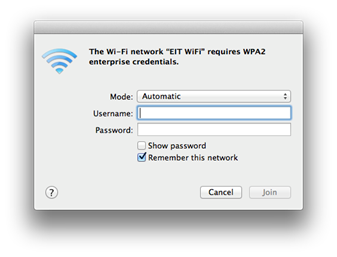 Mac OSX will prompt you for your EIT Network username and password. Enter these then click the Join button. 4. If the Verify Certificate screen appears, click the Continue button. 5. 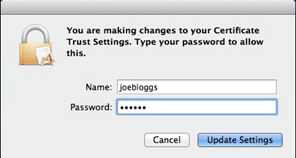 If prompted enter your Mac OSX account credentials and click Update Settings to accept the certificate. 6. At this stage you should be successfully connected to the EIT WiFi. 1. On your device go to Open Settings, select Wi-Fi and slide Wi-Fi to On. 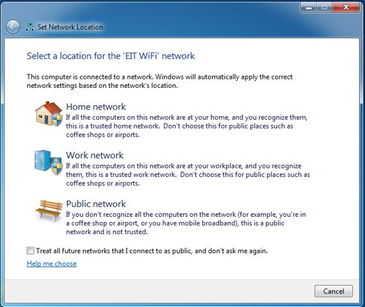 Select EIT Wi-Fi. 2. You will be prompted to enter a username and password. Enter your EIT network username and password. 3. Click Join. You may be prompted to accept a security certificate. If so, tap Accept. 4. 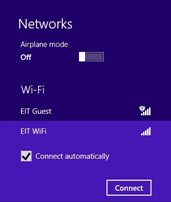 At this stage you should be successfully connected to the EIT WiFi.